The Indian Film Festival of Ireland (IFFI) 2017 will be screening The Man Who Knew Infinity with the help of the Ireland India Institute in Dublin City University, Glasnevin Campus (room CG86), Friday 15th September at 2pm. This screening is part of the 2017 edition of the Film Festival, which entered its 8th edition. It is held 15-17 September 2017. Below are the different screenings available during the Festival. Please note that some screenings are free to attend and some require advanced booking. The Festival Red Carpet Opening. Reception at 5 pm. Foyer in Dundrum Cinema. 15th September: Rathmines Public Library. 15th September: Pearse Street Public Library. 16th September: Rathmines Public Library. 16th September: Pearse Street Public Library. 16th September: DIT Aunger Street. 17th September UCD Belfield. Free Screening. 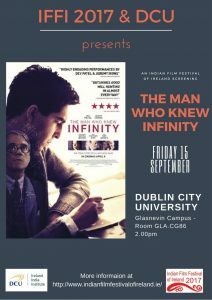 12.30pm-2.30pm: The Man who knew Infinity. Advance booking at the Dundrum Cinema and tickets also available at the box office.